Jesse Hernandez probably thought he’d seen the last of Crispian Ng on the weekend of January 19-20, when he sent him west during the Omega Billiard Tour’s 2013 season opener Saturday night. Ng, though, came back from the one loss side to challenge Hernandez in the finals, pushing him to double hill before Hernandez prevailed to claim the season-opening event title. 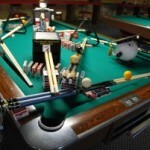 The $1,000-added, handicapped event drew another full field of 64 players to the 24-hour Rusty’s Billiards in Arlington, TX. 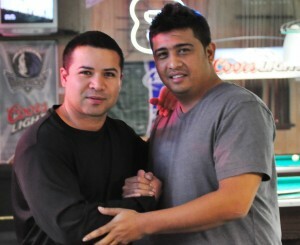 From among the winners’ side final four, Hernandez defeated Steve Raynes 6-4. Coy Lee Nicholson, winner of the tour’s debut stop in October, squared off against Greg Sandifer and lost 7-4. In the hot seat match, Hernandez then defeated Sandifer 6-4, and sat in the hot seat, waiting for Ng. Ng moved west defeating Mike Voelkering 7-4 and Benny Scott 7-5, to draw Nicholson. Raynes faced Joseph Olivarez, who’d gotten by David Reyes 7-1 and David Josephson 7-3. Ng battled to double hill against Nicholson before prevailing and moving on to the quarterfinals against Raynes, who’d eliminated Olivarez 6-4. Ng chalked up his fourth straight win defeating Raynes in those quarterfinals 7-4, completing his one loss-side run with a 7-5 victory over Sandifer in the semifinals, and turned for a second shot against Hernandez. Hernandez had a game on the wire at the start. Ng fought to double hill, but Hernandez prevailed to capture the $450 top prize, as well as a Lucasi Hybrid Cue (valued at $380). Hernandez’s girlfriend was very excited about “her” new cue. Tour director Melinda Bailey thanked the ownership and staff of Rusty’s Billiards, as well as Michael Hoang of Omega Billiards, and Lucasi Hybrid Cues for sponsorship of the event. The next stop on the Omega Billiard Tour is a $1,000-added event, scheduled for February 23 at The Billiard Den in Richardson, TX. The Predator Player Points Tracker is going to be tested all year long to see who wins the coveted Predator prizes at the end of the year! The top 3 ranked players earn Predator Prizes and everyone is anxious and ready to place higher and higher in the stops to move up on the list! Sitting in first place is Jesse Hernandez, followed by Crispian Ng in second and Greg Sandifer in third. CSI / BCAPL are giving free entries to the 2014 BCAPL Nationals for players ranked 4th-8th at the end of the year, also. Thank you to our additional sponsors, OB Cues, Irving Ink and Thread, and BilliardsPress.com. Each stop is limited to 64 players and the first two stops were full weeks 2 before. The 2013 season opener at Rusty’s was full 3 ½ weeks before. However, in a new record, the next stop at The Billiard Den Feb 23rd is ALREADY full! Make sure you get your name in early and send in your payments for the future stops! There is high demand for the new Omega Tour in the DFW area. Further, players must play in at least three events in 2013 to be eligible for the Season Finale in December (at least $2,000 for that event). Thank you to all the players, fans, sponsors and pool rooms!! !